Can I order Mythotopia if I'm located outside the EU? Unfortunately not — if you order Mythotopia in your survey and have a shipping address outside the EU, your game will not be shippable. No, your order must only contain one edition (language) of the game, as each edition is being shipped from a specific fulfillment center. A Group bundle is now available for the English edition. Buy 5, receive 6*, plus single consolidated shipping to one destination of your choice. See the Group Buy pledge level on the main page. It works out at $42 USD per copy. A single copy of AuZtralia weighs approximately 2.7kg and measures 30 x 30 x 7 cm. Local Pickup not possible, sorry. A Group bundle is now available for the English edition. Buy 5, receive 6*, plus single consolidated shipping to one destination of your choice. See the Group Buy pledge level on the main page. It works out at £30.00 per copy. Koszt dostawy w Polsce będzie typowy dla kurierskich wysyłek krajowych (paczkomatem i pocztą nie wysyłamy). Cena podana na stronie kampanii wynika z faktu, że możecie prosić o wysyłkę polskiej edycji na inny adres niż polski. Koszt wysyłki opłacicie po zakończeniu kampanii w tzw. Pledge Managerze; tam też podacie adres dostawy i wybierzecie język swojej edycji gry. Przy zakupie grupowym (Group Buy) polskiej edycji gry, dostawa w Polsce jest darmowa. A Group bundle is now available for the English edition. Buy 5, receive 6*, plus single consolidated shipping to one destination of your choice. See the Group Buy pledge level on the main page. It works out at $57.50 per copy. LOCAL PICK-UP: Yes, from either: * SchilMil office in Birkenhead, Auckland, or * Cakes N Ladders board game cafe, 173 Symonds St., Auckland, or * by arrangement at one of the local Auckland Games meetups. Message Amanda through Kickstarter or Facebook to organise this. Any volunteers to act as our Wellington or Christchurch pick up points? Please let me know. Il ritiro a mano della versione italiana di AuZtralia è possibile, per altre informazioni consultate la pagina della campagna su Giochistarter. Die deutsche Ausgabe (AuZtralien) kann versandkostenfrei am Verlagssitz in Oberhausen oder am Warenlager in Langenfeld abgeholt werden. Die Versandkosten sind eine Pauschale. Auch wenn weitere Exemplare des Spiels hinzugefügt werden, bleiben die Versandkosten gleich. Frais de port : France, Belgique et Luxembourg 1 boîte 11€, 2 boîtes 13€ ; Suisse : 1 boîte 15,5€, 2 boîtes 18€ ; Dom : 1 boîte 35,5€, 2 boîtes 41€ ; Québec : 1 boîte 15€ (24CA$), 2 boîtes 25€ (40CA$). Le pick-up pour l'édition française sera possible à Essen et à Rennes. A Group bundle is now available for the English edition. Buy 5, receive 6*, plus single consolidated shipping to one destination of your choice. See the Group Buy pledge level on the main page. It works out at $54 CAD per copy. Para apoiadores no Brasil: Devido às altas taxas e impostos e frete, os custos de envio no Brasil será U$ 35. Isto já inclui todas as despesas de envio para o endereço do apoiador e também todas as taxas e impostos de importação no Brasil. Note que mesmo se você escolher retirar na sede da Ludofy, este valor também será cobrado. Para apoiadores em Portugal e outros países EEC: Teremos o prazer de enviar esta edição em Português do Auztralia para você na UE, com preço de envio amigável de £15.50 por cópia. 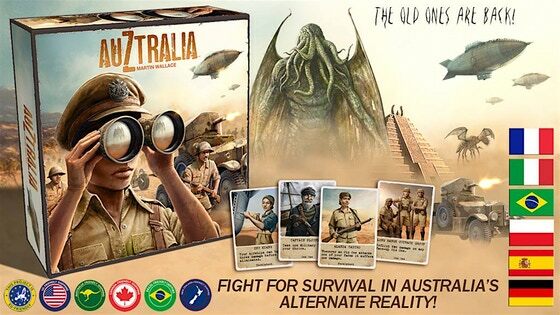 The English edition of AuZtralia will be available via our Australian partner Lets Play Games, who will fulfil all in-country Kickstarter pledges. Note that our Group Buy saves considerably on shipping costs. We will continue to explore local pick-up options but we have no further news as yet. Can I collect the game in person to save the shipping fee? Yes. Provided you made arrangements with the relevant publisher/distributor beforehand. See the FAQ for your country below. Pledge using the 'Local Pick Up' reward level. Are all language version shipped/produced at the same time? We are aiming for that to happen, yes. Can I order Mythotopia if I'm located outside the EU? Can I order more than one language edition of AuZtralia? (eg a German and an English) FAQ for USA FAQ for UK FAQ for SPANISH EDITION FAQ for POLISH EDITION FAQ for NEW ZEALAND FAQ for ITALIAN EDITION FAQ for GERMAN EDITION FAQ for FRENCH EDITION FAQ for ENGLISH EDITION TO REST OF EUROPE FAQ for CANADA FAQ for BRAZIL and PORTUGAL FAQ for AUSTRALIA Can I collect the game in person to save the shipping fee? Are all language version shipped/produced at the same time? I want to know when my reward is shipping. I am having trouble filling out my survey. I would like to make a change to my pledge. I would like help with preorders. I have a issue with my pledge finances. I have a question for the project creator. I have a question not listed here. I want a refund for my initial campaign pledge. I have a question about BackerKit.